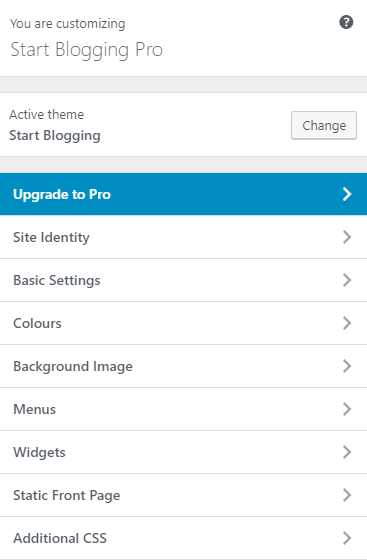 Most themes will utilize the WordPress built-in customizer which lets you see live previews of your website as you make changes from whatever options are available with the theme, as well with WordPress itself. 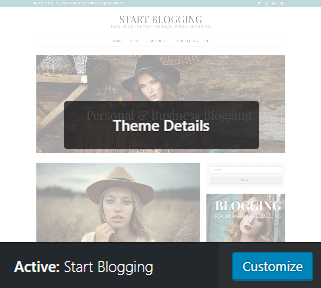 The free version of Start Blogging adds a few extra tabs to the customizer with a variety of features and options. I will go through the theme options while leaving out the default WordPress settings; you can check out the WordPress website for those. Whatever changes you make from the customizer, you will see a live view in the preview window to the right side of the tabs column. However, any changes you do make won’t take effect until you click on the Update & Publish button at the top of the customizer window.